Orange Then Blue has long been recognized as one of the driving forces of contemporary big band music. Since bursting out of the busy Boston jazz scene nearly a decade ago, the group has become widely known as a creative force to be reckoned with. Appearances at the Montreal International Jazz Festival and New York City’s Knitting Factory drew large audiences eager to hear Orange Then Blue for themselves. 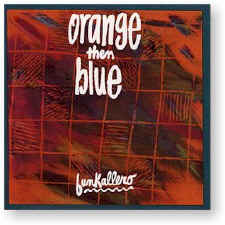 On Funkallero, Orange Then Blue’s fourth release on GM, the 12-piece ensemble performs nine original compositions and arrangements by drummer George Schuller, saxophonist Matt Darriau and other band members, drawing from the extended jazz forms of Charles Mingus, the provocative orchestrations of Gil Evans and the haunting folk melodies of Bulgaria and the Andes, among a plethora of other sources. Tying it all together is the loose-limbed swing that has made Orange Then Blue a superb ensemble and an ultimate soloists’ band. Recorded on (except #8) 14-15 August 1989 at Inner City Sound in Boston, Massachusetts and (#8) 19 November 1989 at Inner City Sound in Boston, Massachusetts.